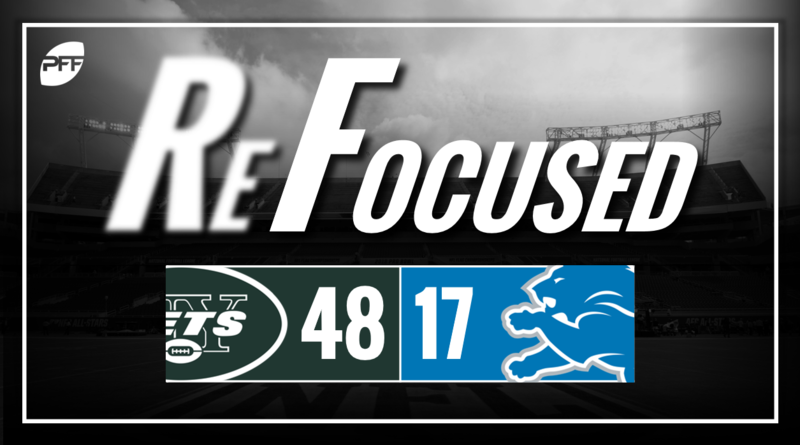 The New York Jets defeated the Detroit Lions on Monday night, 48-17, kicking off the Monday night doubleheader. After a pick-six on his first throw, rookie quarterback Sam Darnold‘s mobility and accuracy were on display. Whether throwing slants on run-pass option plays or throwing crossing routes down the field, Darnold did not look like a rookie as he directed the Jets offense. Though far from perfect in this game his high skill level was evident. Isiah Crowell and Bilal Powell each had their moments running the ball for the Jets offense. Crowell had a beautiful long run on an outside zone play in which he broke through the line and outran defenders as they both utilized the Jets’ one-back zone blocking as their weapon of choice to run the ball which set up Darnold for a couple of nice completions off of play action. The highlight of the night came on Darron Lee‘s interception return for a touchdown as he was strong in coverage all night long and was responsible for another interception on a forced throw over the middle where he showed athleticism to leap and make the grab. Early on, when Detriot was still in the game, their running game was shut down in the middle by Steve McLendon who may be one of the most underrated run stoppers in the league. He was consistently controlling the Detroit interior, forcing the Lions into throwing. Well, you can’t start out a conversation about the Lions offense without talking about the five interceptions thrown by Lions quarterbacks on Monday night. Matthew Stafford was responsible for four of them. Too often he forced the ball into coverage trying to make too much happen and did not give his team a chance to win. One of the best performances of the evening for the Detroit offense came from second-year WR Kenny Golladay. He was strong on crossing routes and unafraid to high point the ball in traffic across the middle. Detroit’s defense, while far from perfect, did create some nice plays up front. Rookie defensive tackle Da’Shawn Hand was outstanding against the run up front, while Devon Kennard played well from his end position. The Lions secondary, however, struggled at times in the as Darnold moved the pocket and found open receivers targeting Nevin Lawson a couple times in particular. The Lions defense, in general, was not awful and obviously, the turnovers on offense hurt their chances to stay in the game. Detroit: Plainly, this game was lost due to a few horrific decisions by Stafford. While he was not awful on the whole, making several nice throws, he made four very poor decisions which were catastrophic to the Lions chances of winning the game. New York: Darnold had a steady hand while showcasing his talent and the Jets running backs were good at taking advantage of space to run when it was available to help lead the Jets to a win.